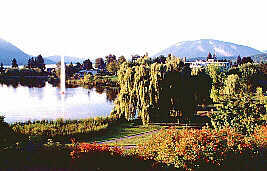 Salmon Arm is located on one of the most popular resort lakes in the province. On the Trans Canada Highway, west of Sicamous, Salmon Arm offers visitors a wide range of recreation possibilities plus providing almost every service and convenience you could want. This quickly growing community of Salmon Arm, BC, is becoming popular for its climate and amenities.The pleasant summer days and the 21'C (75' F) lake temperature bring visitors to enjoy a myriad of water activities plus sample the treats from nearby orchards. Definitely a summer playground for the whole family.Winter time also brings a host of activities with their x-country ski loppet a highlight. Access: Salmon Arm is located 106 km (64 mi.) east of Kamloops, BC, on the Trans Canada Highway, from points east you again travel on the Trans Canada. The 104 km (64 mi). from Revelstoke takes you past a wide variety of scenery from mountains to lake shores. From the south Salmon Arm can be reached by passing through the sunny Okanagan or using the Coquihalla Highway from Vancouver. From any direction, whether by car or bus, you will enjoy the scenic trip and be pleasantly surprised with your surroundings once you reach this town on the edges of the vast Shuswap Lake. Climate: Mainly hot and dry summers, with moderate to cold winters. Recreation Facilities & Activities: 18 Hole Championship Golf Courses; Recreation Centre and Arena; Yoga Studios; Mountain Biking; Hiking Trails; Equestrian; Public Beach Access; Off-Leash Dog Park; Cross-Country Skiing; Snowmobiling. Local Attractions: Haney Heritage Historic Village & Museum; Waterfront Nature Park; Herald Provincial Park & Margaret Falls; Sockeye Salmon Run; Roots & Blues Music Festival; Waterslides; Wine Touring; Houseboating; Water & Beach Activities. Accommodations: Besides a number of hotels, motels, and bed & breakfasts, there are many popular resorts and campgrounds scattered along the lakeshore close to town. Herald Provincial Park, located across the lake, offers camping, swimming, and hiking.